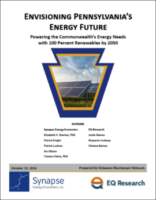 EQ Research co-authored a report with Synapse Energy Economics for the Delaware Riverkeeper Network entitled Envisioning Pennsylvania’s Energy Future: Powering the Commonwealth’s Energy Needs with 100 Percent Renewables by 2050. The report summarizes the policies needed for Pennsylvania to transition to a clean energy future, one powered entirely by renewables. By evaluating Pennsylvania’s current consumption of energy and its direct emissions from burning fossil fuels, the report identifies a path toward a completely renewable energy future by 2050. It also shows that over the same period Pennsylvania could see a net increase of nearly 500,000 job-years, or an average of 14,300 job-years per year, by investing in clean energy. Outlining plans for broader electrification, increased investment in renewables, as well as improvements to energy efficiency, the report offers guidance for developing a clean energy future in Pennsylvania that can serve as a model for states around the country. The 100% renewable scenario would result in energy savings of $134 billion from 2015 to 2050 and $9 billion in electric bill and fuel cost savings in 2050 alone. And from this investment, the report authors conclude PA could see a net increase of nearly 500,000 jobs over the same period. Click the link on the left to download the report.